Twenty plus years training recreational, competitive and trail Paso Finos. A safe and sane recreational riding horse is a true pleasure to own and ride. Getting them there takes time, dedication and knowledge. We don't rush this process,ensuring that the foundation we build is solid and complete. Horses develop at a pace that is determined by their own physical and mental abilities, while still being challenged and conditioned so as to obtain the best results for each horse. We do not start or work our own young horses before they are physically capable of handling a work load. Instead, young horses are stimulated physically and mentally through herd socialization and dynamics as well as with human interaction. Young horses learn amid a herd setting the skills to navigate a number of physical (terrain, obstacles, ground conditions) and mental challenges (pecking order, feed and handling routines) preparing them for future decision making training. I believe that working with the horse to maximize confidence, cooperation and connection between horse and rider. (the process and techniques) encourage horses to develop problem solving abilities, and to make decisions based on situations and obstacles that may arise. Horses are exposed to traffic, wildlife, dogs, water crossings, hill climbs and natural trails while riding independently as well as with other horses. All activities are trained to the horse's natural ability of gait and athletic prowess with natural horsemanship and traditional Paso Fino training techniques blended together and tailored to your horse's specific needs. If you want your horse to be well rounded, sane and trail savvy bring them to a trainer that specializes in creating the recreational horse the right way, at the right age. competing in competitive trail riding is a popular sport with trails and obstacles that suit riders and horses from novice to the most experienced. The length of trails can range from 6 to 25 miles with various numbers of judged obstacles. Obstacle difficulty varies depending on the division entered; riders and horses and are judged on ability to navigate each obstacle/task. As the sport grows so does the level of competition of each division - we can help you and your horse prepare for the competition. We can develop your arena trail, western pleasure and versatility Paso Fino!!! In addition to natural trail obstacles, we introduce your horse to stadium style artificial obstacles that may be encountered in PFHA trail classes. Your horse will learn side passing, directional backing, obstacle walk overs, item drag and carries and a 2 foot jump. We also offer training and conditioning for speed and distance events including turned miles, stamina building and physical conditioning. Horses must be a minimum of 36 months of age with atleast 30 days starter training to be able to benefit from trail training. If you have a young horse that you would like started, this service is also available to select young horses that will be further developed as trail and recreational horses or specialty class entrants. We do not accept horses under 36 months for training due to the demands of these activities. Whether it’s for fun, to feed your competitive nature, or a sheer need for speed there are a number of disciplines and events that can satisfy your desire. The Paso Fino’s natural athleticism and competitive nature make them well suited for a number of equine activities. Not every Paso Fino can perform at top competitive levels but everyone can go out and have fun with local groups that hold these events. When choosing a horse for open contest events I look for sound conformation, sensible attitude and preferably a history of working horses in the lineage. These attributes are all taken in to consideration prior to starting a horse for events training. While correct conformation is a primary consideration, type can also play an important role in the discipline you choose. A good mind, willing attitude and strong work ethic is crucial when choosing a horse. Contest events require lengthy training and conditioning, the horse must be willing and able to stand up to the rigors of training. There is no doubt that the working horse is bred – genetics play an important factor, not only in conformation but also in temperament and a work ethic. As you study lineage you will start noticing the same names over and over as well as a specific look or type to lines that lend themselves to open contest events. For me, gait is the highest priority – I ride Paso Finos for the gait, the versatility of the breed is an added bonus and selection of our working horses is based on these factors. I start my Paso Finos with traditional and natural horsemanship methods. I do not start event training until the basic riding and gait work has been completed. 1) Buy the horse then determine what it is be best suited for. This may be the easier of the two options. Finding the perfect horse for you and your lifestyle is the first step to a great partnership; if you did your homework before purchasing the horse you know that you are well suited to each other. The next step is choosing an activity that is suited to the two of you. Evaluate your horse’s strengths and weakness; physical, temperament and brio should all be considered. Start basic maneuvers and conditioning of a couple of different activities to determine you horse’s hidden talents. Always keep in mind your skill level and ability to train the horse unless you are planning on using a professional trainer. 2) Searching for a horse to compete in a specific event. If you have already found an event or activity that interests you the next step is learning what to look for in a horse that does well in this event. Ask others that participate in the event, talk to breeders with pedigrees that have performed in the events. The final step is to find a horse that has those attributes and that matches your skill level, one that fits well with you and your lifestyle. Start your search with horses that have started training for the discipline or one that is already competing. If you can not find one that is started, speak to breeders or trainers that may have prospects or that have clients who raise horses for the discipline. If it is an event that is not well represented by Paso Finos, look at the other breeds that are competing and note conformation, size and type characteristics. Looking for these characteristics in the horses you are evaluating can help narrow your search. Another consideration is whether to buy a young prospect or a finished horse. Either way, you want to deal with an owner/breeder or trainer that has experience with Paso Finos being used in open contest or daily versatility style work. When choosing a young horse you will have to rely on the seller’s knowledge, your experience and the natural ability, temperament and conformation of the young horse. If possible you will want to view as many horses from the same pedigree as possible. Ask to see the sire and dam and any siblings that are under saddle and competing. Talk to other owners that use the same lines and ask the breeder for the names of people that are using horses they have produced or trained. Developing a young horse into the kind of competitor that you want can be both challenging and rewarding. If you have the skills to work with a young horse, or are willing to work with a trainer later on this may be the option that is best for you. It allows you to develop the horse the way you want without dealing with any habits that may have been instilled by previous handlers. If you do not want to wait, or are not confident enough to train a young horse then you will need to start the search for a proven events horse or one that is old enough to place with a trainer immediately. If it is a finished horse you are looking at you will want to see the owner or trainer work the horse. Follow this up by riding and working the horse yourself, ride it in a way you are accustomed to as well as working with the owner or trainer to learn specifics of the horse’s training. Once it is determined that the horse is capable of performing the tasks you require, make sure that all other aspects of the horse are a match for you. You are going to be spending a lot of time together competing and training, make sure it will be a good partnership. All purchases should be dependant on a number of follow-up visits as well as veterinarian and farrier evaluation. If you are working with a trainer that is not presenting the horse to you bring your trainer with you on one of the initial visits. 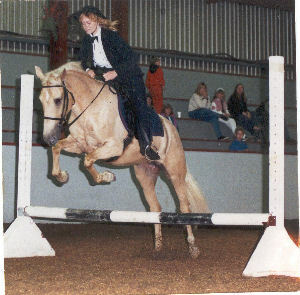 Your trainer can give you tremendous insight and help to determine if the horse matches your level of riding and skills. Our breed has so much to offer, with few limitations. If you love the Paso Fino but want a change of pace try a different discipline: speed events, ranch versatility events, trick training or distance riding could be just what you are looking for!! Private and group clinics are available at your location or at our farm. Good trail horses are just plain fun to ride!! Are you having this much fun with your horse?